The magazine is out. The first photo has been released. Here's your first look at Justin Timberlake and his bride, Jessica Biel. Jessica wore a custom, petal pink Giambattista Valli Haute Couture gown. The bridesmaids, mother of the bride and mother of the groom also wore Giambattista Valli Haute Couture. Justin and his groomsmen were all in custom Tom Ford tuxes which he helped design. Justin played the guitar and sang as Jessica walked down the aisle. He said, "It was an original piece I wrote specifically for the evening and for her." Biel said, "It was a total fantasy experience." The week-long celebration and ceremony reportedly cost $6.5 million dollars. There were approximately one hundred guests including Jimmy Fallon, Andy Samberg, Timbaland, and Beverley Mitchell from 7th Heaven. *NSYNC's JC Chasez was there, but the other guys weren't invited. Justin said, "It was a lot to ask of them to travel, so we figured we'd give our guests a good party!" Anyone else notice Britney Spears on the cover? Gah hilarious! When I posted about the cover earlier I totally missed that... HEEELARIOUS! I didn't even notice Brit until you said something - that's awesome! Love this picture - it's so different from what you usually see. YES!!! That is the best photo bomb for reals!!! Haaaa!!! While I love Justin Timberlake, $6.5 million dollars is just ridiculously disappointing to me. =( I can't help but think of all the good that could have come from that amount of money. If I could have pulled off a pink wedding dress, I would have done it in a heartbeat! She looks lovely. Im slightly jealous. I love the photo bomb comment. Cracked me up!!! I have to admit I love that she wore pink. AWESOME! They will always, always be connected. Brit + JT 4eva. Jessica looks amazing and I love her dress. I kinda can't believe they did this with People though. I thought they were more down to earth and tried to keep their relationship private. Why did they only invite the less popular members of NSync? It's not like Lance or Joey would have stolen their thunder. LOL! Look at Brittney on the cover, that's great! I would have never pegged Jessica to be the Pink type but it's really pretty. I'm so happy her bangs were styled not so blunt to soften her look. Sounds like one hell of a party! And seems super odd that only half of NSYNC was invited... due to traveling? Whatever I invited people from all over the US to my wedding. I'm really excited for these two. I love Jessica, and JT. In other news... I really wanna party with Jimmy Fallon and Andy Samberg, is that too much to ask? 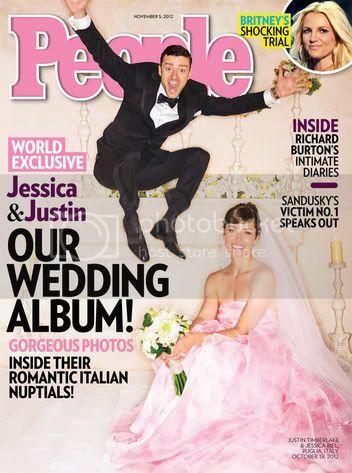 PS - I love that JT is totally animated on the cover and it's not a cheesy.. pose for a wedding photographer moment. I'm in LOVE with her gown!! That Brit pic canNOT be an accident. I hope their marriage lasts longer than Kim Kardashian's.